Interest in local food has been steadily progressing across the country. “Local food” is that which is grown near the people who eat it. On the average, something under one percent of the food consumed in the US is grown locally. Achieving ten percent local food (in ten years) is a threshold objective for a more robust local food system. In 2010, Vermont, a national leader in local foods, which was then at five percent, set the ten percent goal for 2020. They reached 12.9% local food in 2017 surpassing all expectations. · Local food expenditures increased from $114 million in 2010 to $289 million in 2017. · A net of 6,559 new jobs were created. · A net of 742 new businesses were created. · Food insecurity dropped from 13.2% to 9.8%. 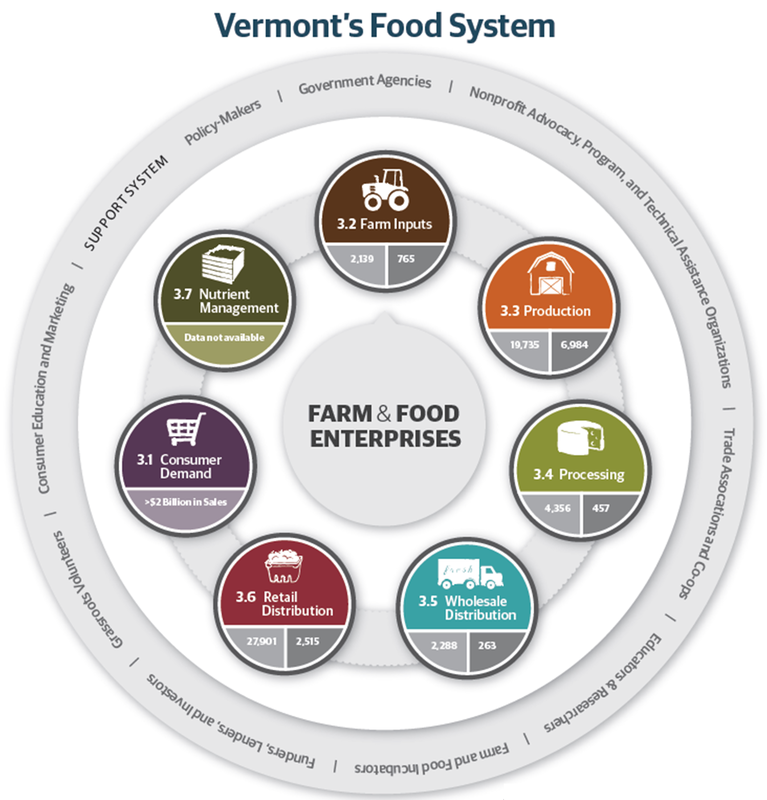 This case study contains a brief outline, drawn from a variety of documents and articles, about the development and implementation of the Vermont Farm to Plate (F2P) project. The details can be found at the F2P web site:https://www.vtfarmtoplate.com. The Vermont Farm to Plate project has made noteworthy progress. It is up for reauthorization by the Vermont legislature in 2019. As all great projects do, it has identified significant barriers to further progress that are portents for us all. Resilient communities require robust and diverse local economies. The Transition Centre Foodshed Strategy program (http://www.transitioncentre.org/foodshed-strategy.html) proposes that local food is the foundation of resilient communities. There is a considerable literature and numerous planning documents about foodsheds in the US and many excellent projects and programs around the country. However, where progress is being made, it is often slow and challenging. We need to study these programs and understand the successful approaches to overcome the challenges and accelerate progress. Transition Centre Foodshed Strategy focuses on localized planning and implementation and particularly scalability. It proposes a synthesis, a blueprint, for expanding local food economies for which Vermont stands out as a model. Saying that, there are a number of unique characteristics about Vermont that helped define their F2P program. All communities are essentially unique in character and temperament and each must create a program that meets its needs. Nonetheless, there are certain core practices that are essential and a clear framework of best practices to build on. These represent the “grammar” of a successful foodshed/resilient community enterprise. The Vermont Farm to Plate program was mandated by the Vermont Legislature. It was organized and carried out by a non-profit organization. In 2008 Vermont’s dairy industry, 70% of the state’s agricultural economy, was in crisis. Over the previous three decades Vermont had lost over 20% of its farmland. Then came the 2008 recession. In response, the state legislature created the Farm to Plate Investment Program and in 2009 tasked the Vermont Sustainable Jobs Fund (VSJF), which had been created by the Vermont legislature in 1995, as a 501c3, to bolster the state’s green economy, with developing and implementing a ten-year strategic plan to strengthen Vermont’s farm and food sector. 3. Improve access to healthy local food for all Vermonters. The legislature provided $100,000 and private foundations gave another $50,000 to start. The strategic plan took 2½ years and $300,000 to complete. VSJF has a small staff. Networking and stakeholder engagement were key ingredients to developing and implementing the plan. Some 1,200 people participated in meetings. Six work groups were formed to handle strategy, eight task forces were formed to address specific issues and five “cross-cutting teams” were created to make connections between them. As noted, there is an extensive, and excellent, body of research about developing local food systems. There are a lot of comprehensive and data-packed plans. Bringing those plans to fruition, however, is always a daunting challenge. The key word in real estate is location, and in that respect, Vermont is certainly a leading candidate for a local food revolution. The important term, however, is organization. It takes a plan. It requires leadership. It requires great staff (leadership in depth). And it requires broad public support. VSJF brought these ingredients together. The January 2010 “Interim Report to the Legislature” by VSJF and the Sustainable Agricultural Council, gives insight into the scope and process for developing the strategic plan. Over a period of six months, VSJF staff organized the planning process and achieved several of its objectives. These include a SWOT analysis, a ten-year blueprint, potential impacts and how to measure them. They made an inventory of organizations and programs that impact Vermont agriculture and developed a comprehensive understanding of the state’s agricultural infrastructure. They developed a list of goals, objectives and strategies, identified investment priorities, made a review of policy, did detailed GIS mapping, and outlined potential initiatives. Attention was given to clearly defining some key terms such as “What is a food system?” and “What is local?” They developed an integral Food System Diagram and explored regional markets outside of Vermont. The first six months (2009) included research, stakeholder meetings and eight local food summits. A lot of effort went into networking. The proposed work for 2010 consisted of engaging stakeholders, holding working sessions on key issues, drafting the plan, and having it reviewed by stakeholder groups prior to submission to the state legislature in January 2011. Nine researchers were also brought on board. There were reports studied, surveys and interviews conducted, and meetings held. There was close attention to feedback. A database of organizations was constructed. A Farm to Plate project manager was hired, and a Strategic Plan Process Team was assembled. 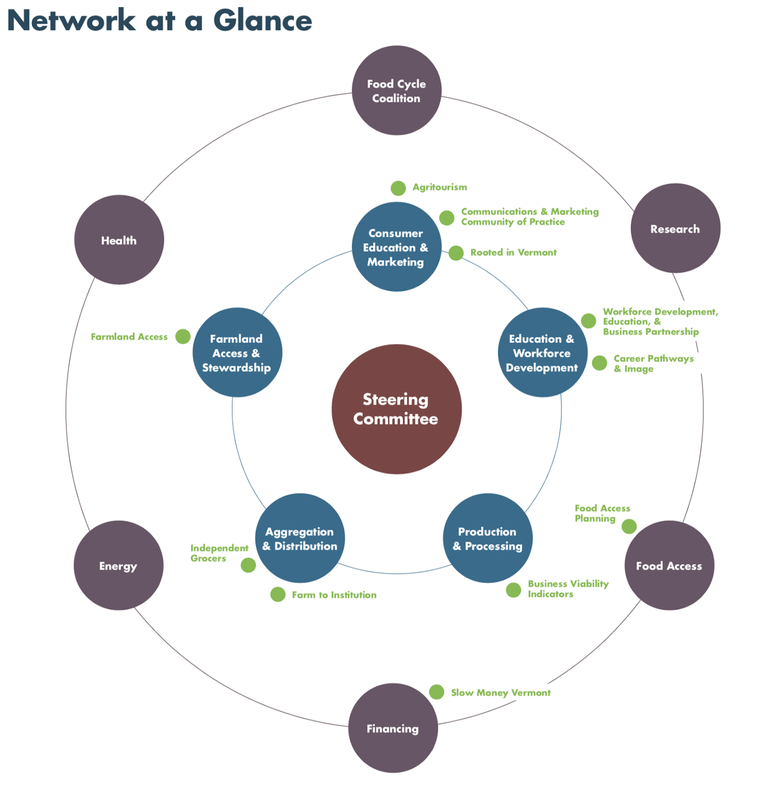 The Strategic Plan Process Team of 19 members includes the Vermont Secretary of Agriculture, University of Vermont faculty, agricultural-related organizations, farmers and farm-related businesses. The Executive Summary of the Farm to Plate strategic plan alone is a document of nearly 50 pages. It introduces the four chapters that represent the body of the plan. In short, the planning document is packed with facts – almost an encyclopedia of local food system planning. This is a planner’s document and an important resource for understanding how the plan, the framework, produced results. The structure of the plan, how it was developed, and the process involved, are important. While the authority came from the top, the process was essentially conducted on the grassroots level. VSJF is a non-profit, not a government organization. There is thus less red tape. It has a small, cohesive staff. It is an economic plan with major social and environmental benefit; about business and jobs for producers, suppliers, processors and distributors, and encouraging investments. It is also about the health, well-being and quality of life for consumers. Vermont is a small state. It is defined by geology – mostly up and down. The Connecticut River and watershed defines the eastern boundary, the west by the Lake Champlain basin beyond which lie the Adirondacks. There are just over 600,000 residents. Population density is low. There are no real cities. It is a beautiful place to live. Vermont is a state of mind. There is something of a sense of belonging, and of community. The project started with a list of economic and social problems and a mandate to remedy them. It began with an understanding that there were considerable local resources to draw on – and then drew on them. It started with a local food economy already well above the national average at nearly five percent. VSJF’s mission was to catalyze change, which meant getting people engaged. Indeed, the best way to make a plan work is to engage the people the plan will impact to produce the plan itself and then to implement it. VSJF did that. The plan is complex and packed with data. It can, however, be used as a model of an ecosystem (a framework Transition Centre has proposed). Human societies are ecosystems. Ecosystems are self-defining and essentially self-governing. If understood correctly they can be guided and nurtured. Social ecosystems tend to decline to a degree that people forget they are part of one. VSJF seems to have understood the necessity of building that ecosystem identity – something perhaps easier to do in Vermont. Five priority areas were identified. First, Meeting Food System Employment Needs in Positive Work Environments. Finding and retaining employees is a major challenge which includes both attracting workers to food systems careers and developing needed skills. Second, Improve Viability of Farms and Food Businesses. The Vermont dairy industry continues to struggle (as it does across the country). Alternative usage of pasture land includes raising grass-fed beef. This requires training in managing ranches and business investments. There are also a variety of infrastructure-related issues that need to be more fully addressed. Third, Increasing Local Food Availability and Affordability in All Market Channels. This includes improving sales to “intermediate markets” such as “restaurants, grocers, schools, institutions, and distributors who explicitly support local producers.” Potential markets are targeted for education and technical assistance. A number of strategies are under study. Fourth, Increasing Consumer Engagement and Demand for Local Food. Increasing consumer awareness, education, agritourism, etc. Polls indicate that people will pay more for quality foods but also point out that work needs to be done to engage more people in making local food a part of their lifestyle. The approach is largely consumer education. Fifth, Protecting and Expanding Affordable and Environmentally Sustainable Farmland in Agricultural Production. More affordable farmland is required to support expansion of the local food program. Seventeen percent of Vermont farmland has been conserved. That is a great deal of at-risk farmland that needs protection. “A wide range of stakeholders and expertise must be involved in this work, from farmers to land use planners, farm business assistance providers to environmental experts.” Significant barriers have been identified that need to be addressed and work groups have taken on this task. Vermont has achieved an essential ingredient in developing a more sustainable economy – a broad-based virtual organization. The Farm to Plate Network is made up of 350+ food system “businesses, non-profit organizations, educational institutions, funders and government agencies.” There is strong agreement that the network is building and strengthening relationships between partners and thereby enabling them to achieve their own goals. Networking is essential to any enterprise. People in a well-defined network tend to form a greater sense of community. They share information, learn new things, gain a better perspective on the food system statewide, and build trust/relationships and collaboration. “Working Groups (WG) are at the core of the F2P Network, one for each major “systems lever”. Each WG takes responsibility for a set of goals, strategies, and indicators from the F2P Strategic Plan to further develop, implement, and monitor annually. Cross-Cutting Teams (CCT) gather a few times a year to assess key issues that cut across the entire food system supply chain. CCTs can serve as a “community of practice” to share best practices and information across the Network, organize events, or conduct research to inform future network action. The 2018 report listed six VSJF staff and a budget of $654,708. Nearly two-thirds of the revenue came from private foundations (funding partners listed), a little over a quarter from the State of Vermont. Thirty percent of expenses were for personnel, 24% for general operations and 46% for projects. The bulk of project spending went into consumer campaigns, leadership stipends and an independent grocers project. In addition, some $1.6 million had been raised for business and technical assistance. The VSJV serves as the administrator and backbone organization to the Farm to Plate Network and manages the analysis and goal tracking of the Farm to Plate Strategic Plan implementation. · “Guides VISION and provides STRATEGIC GUIDANCE and COORDINATION to Network groups. 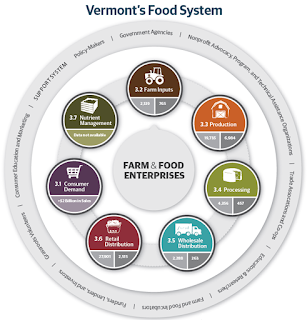 · SUPPORTS ALIGNED ACTIVITIES and FACILITATES DIALOGUE across the Network on key issues to advance new ideas, fix bottlenecks, reduce unnecessary duplication of efforts, and open new markets for Vermont products in a coordinated fashion. · Implements SHARED MEASUREMENT PRACTICES using the Results Based Accountability framework—a planning and evaluation framework used in Vermont by dozens of nonprofits, the legislature, and state government agencies—and tracks progress on the outcomes and goals of the Farm to Plate Strategic Plan. · MOBILIZES FUNDING to support the work of Farm to Plate Network groups and strategy implementation. · Manages COMMUNICATION AND OUTREACH about Vermont’s food system to member organizations and the general public. · Provides PROFESSIONAL DEVELOPMENT and LEADERSHIP TRAINING opportunities for Network members. A continuing crisis is the Vermont dairy industry which represents 70% of the state’s farm sales. Problems include: “structural challenges affecting the dairy industry … resulting in historic farm losses across the state, negative profit margins for many farms, and slow and steady declines in farm equity for many farm families.” Few New England farmers over 65 have a potential successor. The risks include underutilized land and loss of farmland. Regulations, international trade and technology are additional risk factors. A broad range of initiatives have been employed over the past 40 years but are not sufficient to address the continued declining trend. I have made a more detailed analysis of the planning documents, process and goals drawn from a variety of documents.